About the Author: Gilles Bachelet was born in northern France. He has been creating picture books since 2002 and currently works as a freelance illustrator in Paris. His previous books include My Cat, the Silliest Cat in the World and When the Silliest Cat Was Small (both Abrams). Gilles was inspired to write Mrs. White Rabbit after forgetting his girlfriend's birthday. Review: First, let me say you HAVE to take time to enjoy the illustrations, or you're missing at least half the book! The story is funny and engaging, and would be a great read for people of all ages, whether or not they are already familiar with the Alice in Wonderland story. 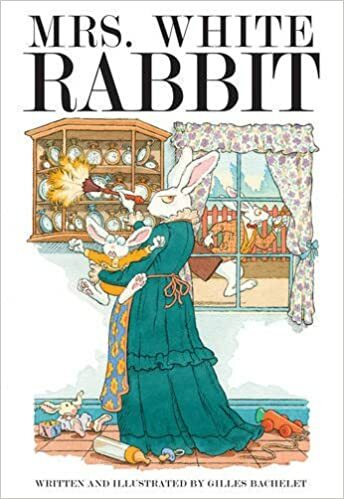 I love the new perspective on the story however - the perpetually late white rabbit's wife as narrator, with glimpses into their home life.